In our hyperconnected world, education, study and research change in a way we couldn’t imagine few years ago… If you haven’t been in Greece, you couldn’t have the chance to see the Parthenon. Now, in hyperconnected world, you can “walk” in the Parthenon Gallery and see the magnificent Parthenon sculptures. by clicking this link from anywhere. I am software engineer & designer with a very strong concern how digital technology and social media can play a key role on people’s cultural awareness. Hyperconnectivity changes the way of living, the way we perceive the world. Museums not only are digitized their collections, but they are adding multimedia details to their exhibitions to offer an enhanced experience. They show how an artifact was in the past by using new technology tools. 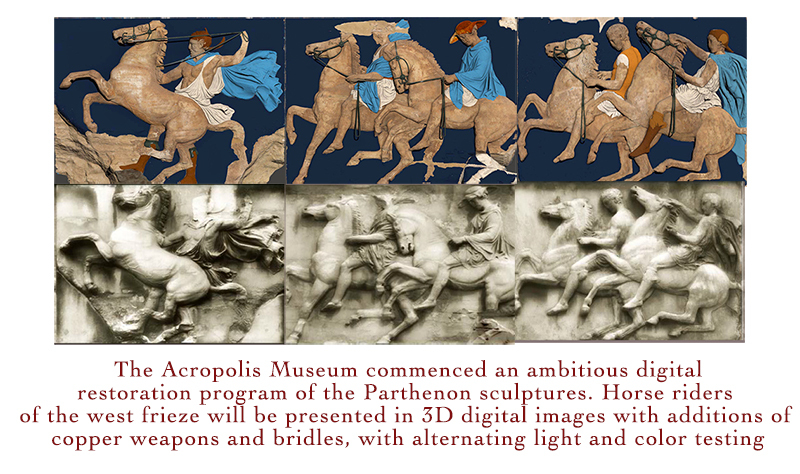 3D digital images of the horse riders of the west Parthenon’s frieze focusing on the colors showing how the Parthenon frieze was in the past, in the Acropolis Museum. When people visiting a museum use a # hashtag to share their moments in social media. It is an evidence that they have been there. Does people look more their digital photo than actual artwork? Louvre museum attracts 8.1 million visitors. So many photos available online but people still want to create their own experience in Louvre museum..
Social media is not only a tool for sharing moments. Am I right? Twitter is one of my mediums to discover new things, to share my thoughts, to communicate…. Sometimes it opens my eyes. I red that the Acropolis Museum will dedicate the IMD 2018 to the hunting dog exhibition. Hunting dog in the Acropolis, I didn’t know that… Where was it stand?.. This information prompted me to make a more thorough investigation of Hunting dog sculpture. The Vravronion was a sanctuary on the Acropolis hill. It was built probably in 459 BC. Remains of it are preserved in the corner of the Propylaea (= gateway of the Acropolis). It was dedicated to Vrauronia Artemida. It has a Π shape. Hunting Dog sculpture found on south of the Parthenon monument, this statue had guarded the goddess of the hunt, Artemis. It probably framed the entrance of the Vravronion. How Vravronion sanctuary was in the past? 3D images from http://www.ancientathens3d.com/ have been created and now people can see how the Vravronion sanctuary was in ancient times. I wanted to share this information with other people.. Twitter is on my hand. Technology change our world. Technology moves fast, it changes itself. Wondering… Will we use the same mediums in few years? to create & share their experience & knowledge with the world.